The kids and I wanted to do something special for their daddy because he works so hard. We decided that we would make him an awesome breakfast in bed. I took the kids shopping at Walmart for the ingredients that we would need and you can see my shopping trip here in my GooglePlus album. 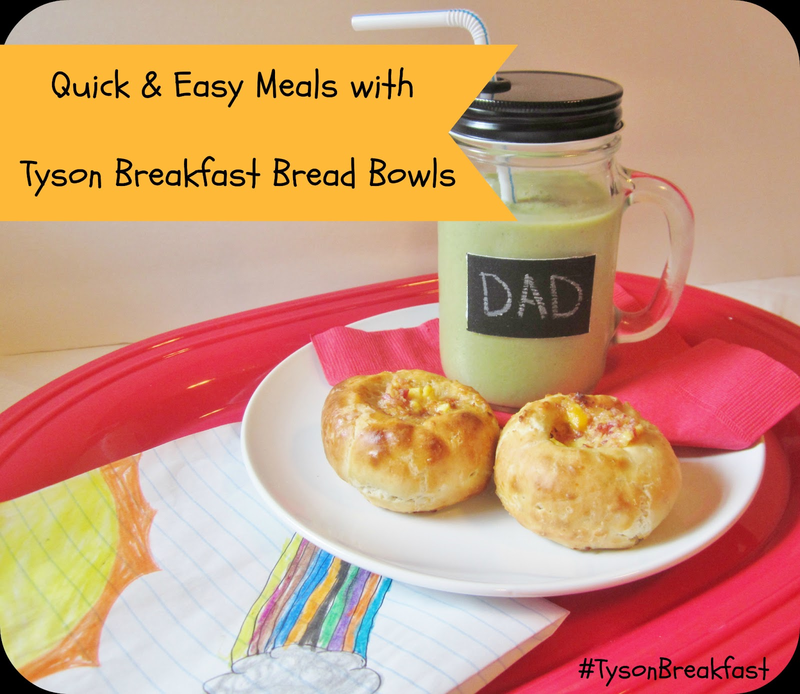 Our breakfast in bed started with the delicious looking Tyson Breakfast Bread Bowls. My husband's favorite food is bacon and the bread bowls were loaded with bacon, eggs and cheese (they also make sausage ones)! The Tyson bread bowls were the perfect thing to give my honey energy for his day at work. 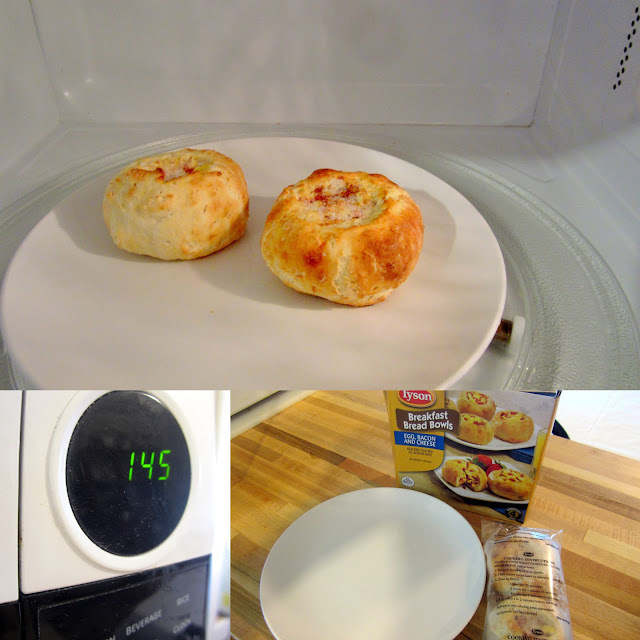 It only took one minute forty-five seconds to microwave two bread bowls. The kids helped me put them on a plate and type in the time for cooking before we began working on the other part of our meal which was a smoothie. I grabbed my Blendtec blender and tossed in 8 oz water, 1/2 banana, 1/2 cup frozen fruit (strawberry, mango, pineapple, and peaches) 1/2 cup plain yogurt, and 1/2 cup frozen spinach leaves. It took only 45 seconds of blending and our smoothie was ready. We poured a tall glass and set it alongside of the Tyson Breakfast Bread Bowls on our platter. The plate was the perfect breakfast filled with all the vitamins and nutritious that would help get our favorite man through the first part of his day. The kids colored a cute picture for their dad and off we went to wake him up for his yummy surprise! My husband woke up a very happy man when he smelled the bacon inside of the Tyson Bread Bowls. He smiled and the kids all piled on top of his back in a fit of giggles as they usually do. Their dad slurped his healthy and fruity smoothie in between bites of the bread bowls. He said that he really enjoyed having a smoothie on the side. The husband also commented on how filling the breakfast bread bowls were. He was really pleased and appreciated the boost of energy to start out his day. Later that night I got really curious about the Tyson Breakfast Bread Bowls and decided to have two for a late night snack. I microwaved a pair for one minute and forty five seconds then let them set for a minute to cool down a bit before taking a big bite. As my teeth sunk in I was really surprised at how satisfying the bread bowls were! If I had not just pulled these out of the freezer to heat up in the microwave I would have thought that they were homemade. These things are delicious and a great frozen breakfast sandwich alternative. I hope that anyone reading this will give them a try for some quick and easy meals. If you want to find out more and follow Tyson's social media channels then check out their Facebook here and Twitter page @TysonFoods.